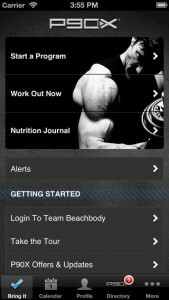 P90X app is rated as one of the best health and fitness application designed for iPhone users. The app is a home fitness and workout program developed by Beachbody, LLC. P90X app for iPhone helps to keep track your sets, reps, weights, review your progress, log your nutrition and keep an eye on your diet. The program is powered with numerous tools to keep track of your exercise and diet regime which makes it a very useful application for health buffs. You can download P90X app for $2.99 from iTunes App Store. P90X app for iPhone is backed with lots of interactive features that have revolutionized home fitness popular among users. The app allows you to schedule your own workouts such as hiking, running, and swimming. The app allows you to download the P90X supplemental videos which help you to perform your workouts correctly. The app conveniently keeps track of your daily reps, sets, weight lifting as you complete each P90X, P90X2, and P90X3 DVD workout. Users can choose for customized progress reports for 30 days, 60 days or 3 months. This helps you to get motivated and change your exercise regime to meet your desired goals. P90X app for iPhone has built in nutrition guide similar to the book version. P90X iPhone app is a wonderful application for those who are looking for home fitness workout program. The guided workouts, graphical progress cards, workout notifications and food intake tracker makes it a must download health and fitness application. Download it now and start a healthy life.